Hair loss is a major concern for many individuals, whether it is caused by age, genetics, hormones, medical conditions or even due to styling practices and/or products. With recent advances in research in the area of hair restoration, new treatments have been created to help combat the issue. Platelet-rich plasma, or PRP, is an advanced nonsurgical remedy that shows remarkable benefits in slowing down, stopping, and reversing hair loss. PRP has produced promising outcomes in patients with alopecia areata. At Artisan 57 Skin & Laser Center in Sioux Falls, SD, we provide this innovative treatment to help restore our clients confidence in the appearance of their hair. By mixing a powerful solution of growth factors and bioactive proteins, we can help strengthen the function of your hair, leading to longer, thicker, healthier locks. "Everyone...EVERYONE is professional and extremely respectful of your needs! They really do want you to have the best products for your specific skin necessities!" "Geat staff that do amazing work. Halo was amazing. Their products are great too"
"Great place! Had an amazing consultation with a silk peel! Def recommend. Staff was very friendly as well." "Wonderful place with great staff!" "Love how friendly everyone is! Makes you very comfortable:) enjoy their lunch and learns that they have so you can learn about the different products they have!!" Any man or woman suffering with hair loss is essentially an ideal candidate for PRP therapy, but those with early hair loss usually yield the best results. PRP is best used for patients with androgenic alopecia, which is a genetically determined type of hair thinning that most often occurs along the top of the head. In women, this could look like a widening part with average hair thickness at the back of the head. Patients with sections of “weak quality” hair growth on the scalp with still-functioning hair follicles usually have the greatest results with PRP hair regrowth treatments. A minimally invasive procedure, PRP therapy is a short 90-minute in-office visit. The procedure begins with obtaining a small amount of your blood and placing it in a special machine. It then rotates the sample at high speeds to separate the platelets from the remaining portion of the blood components. Next, a topical anesthetic is applied to your scalp and microneedling is done on the scalp to create micro-trauma and micro-channels into the skin. The concentrated platelet-rich plasma is reintroduced into regions of your scalp that show hair thinning through small injections. Our protocol for nonsurgical management of hair loss recommends an initial three treatments spaced approximately 6-8 weeks apart and maintenance treatments thereafter every 6-12 months on average. 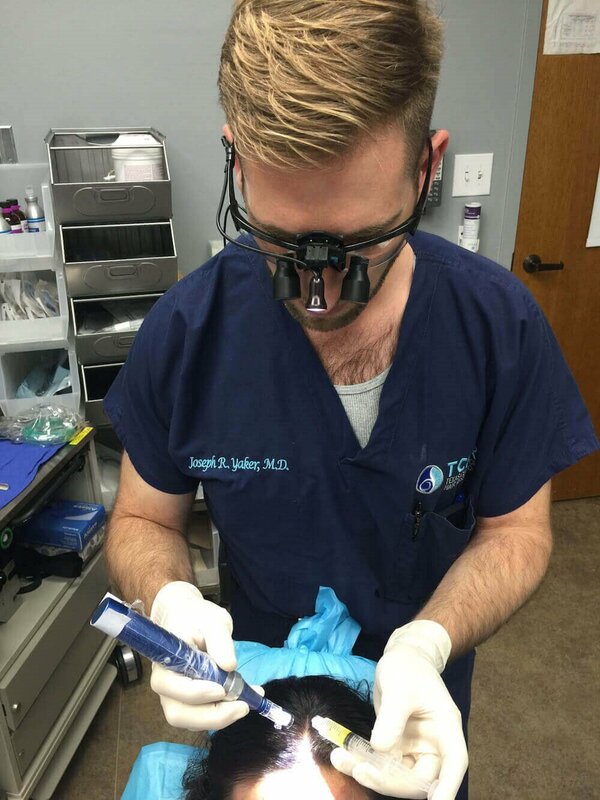 There's no downtime following this procedure with almost no limitations or restrictions. Patients may develop some redness, minimal swelling, and mild tenderness to the treated areas. These symptoms can last up to 48 hours. While results differ for each patient, cosmetic benefits are usually seen around 4 – 6 months after the first treatment and can continue to appear up to a full year following treatment. As PRP is not a permanent alternative for hair loss, repeat treatments are suggested every 6 - 12 months. It is important to be aware that PRP does not grow new hair follicles in locations where you are already bald. It is used to reverse the miniaturization of hair follicles so they will produce healthier, thicker, longer hair fibers. PRP therapy is a scientifically backed alternative for individuals struggling to discover hair-loss solutions. At Artisan 57 Skin & Laser Center, we are honored to provide effective solutions to efficiently treat thinning hair. To find out more about PRP sessions, we welcome you to call our office today and schedule a complimentary evaluation!